Y’all are in for a treat today! 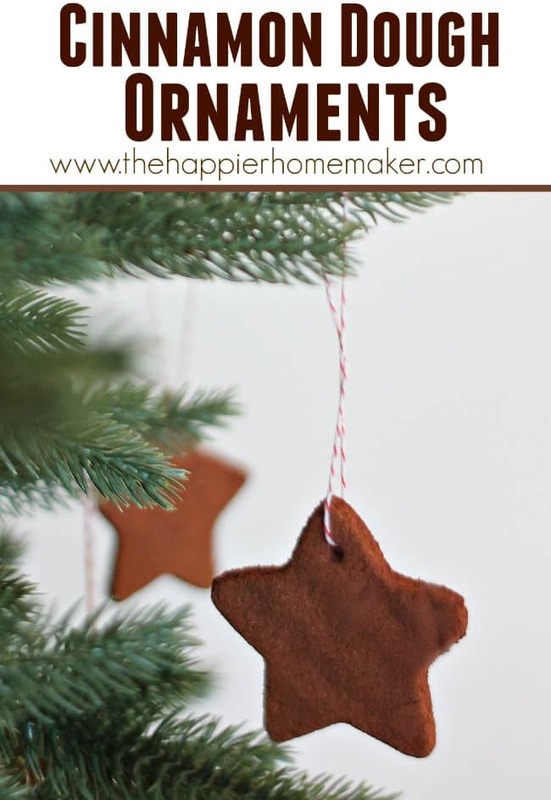 It’s the 8th Day of Christmas Ornaments and the Cinnamon Dough Ornaments I’m sharing today are not only easy and kid-friendly to make but smell amazing! Are you enjoying the series so far? I can’t believe we’re up to 96 ornament ideas already! Preheat oven to 200 degrees. In a stand mixer combine 1 cup of cinnamon with 1 cup of applesauce. Mix until totally blended. (FYI 1 cup of cinnamon is one large 4.12 oz container) Dough should be easy to manipulate and not sticky. If yours is too sticky add additional cinnamon. Lay dough out on parchment paper or baking mat sprinkled generously with cinnamon (just as you’d sprinkle flour down to roll out cookie dough.) 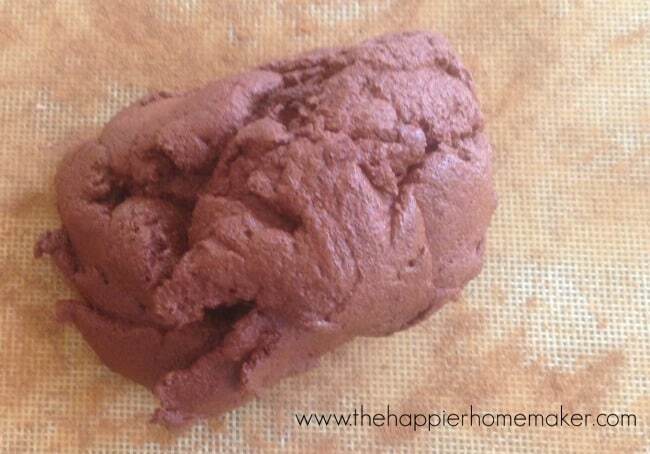 Roll the cinnamon dough out to 1/4″ sprinkling with cinnamon as needed to keep it from sticking. By the way, these smell amazing but taste awful. My 6 year old didn’t believe me that they weren’t for eating so I finally let him taste the dough-it was worth it to see the disgust on his face afterwards, sometimes they have to learn on their own right?! 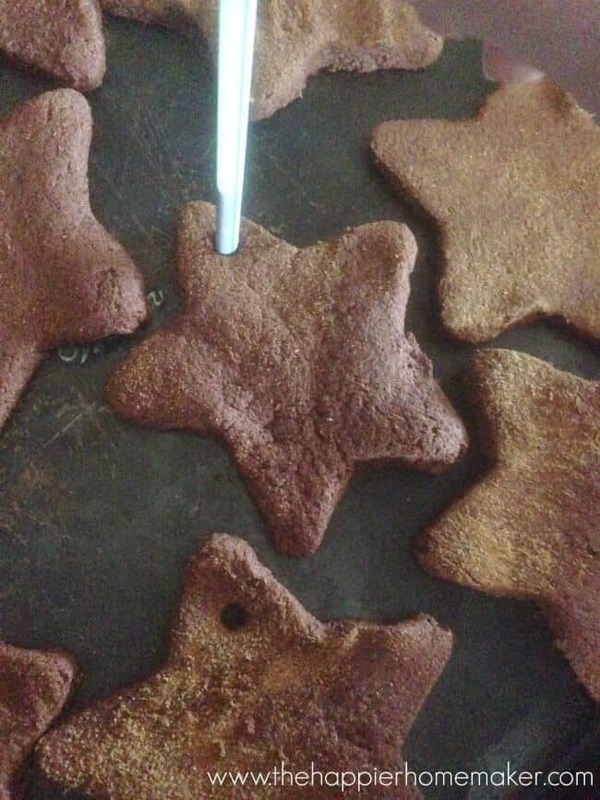 Use a cookie cutter to cut your dough and transfer to a baking sheet. 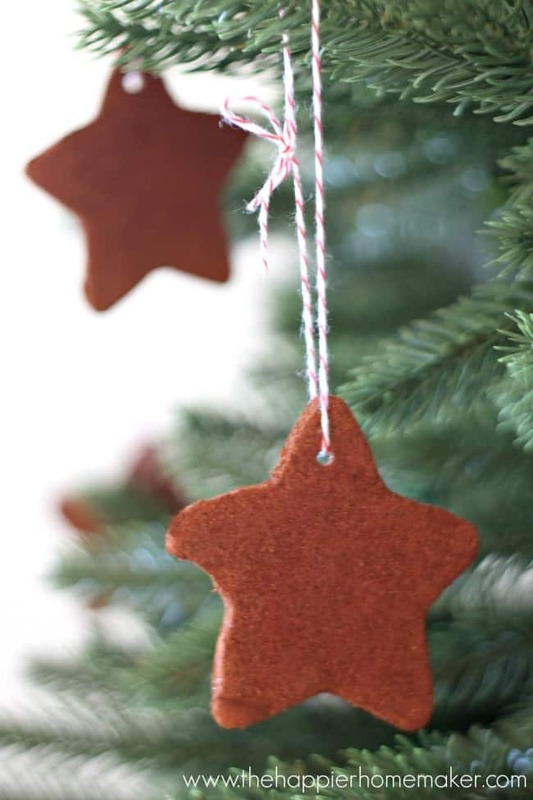 Use a straw or skewer to punch a hole in the ornaments to allow for hanging later. Bake for 2 hours. Remove from oven and allow to cool. Tie ornaments with twine and hang! 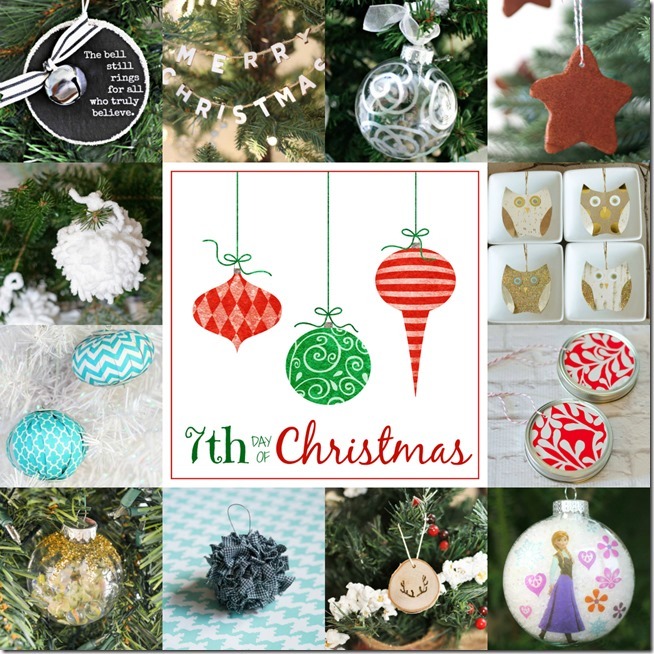 Ready for 11 more DIY ornament ideas? Check out the rest of today’s inspiration! I’m all over any idea that can reduce the smell of dog (sorry my beloved beagle Ernie) … LOVE THIS! Are these make, use and discard or have you tried to use and save to re-use? I have kept mine Jacki, they can be fragile and crack but ours have held up just fine so far! Very valuable information! Thank you. I have had my ornaments for years. They lose the scent but you can put drops of essential oils on them to spruce right back up. It’s still fun to make new ones with the kiddies every few years though. would the dough hold a handprint? i was wondering if i could use these to make handprint ornaments. 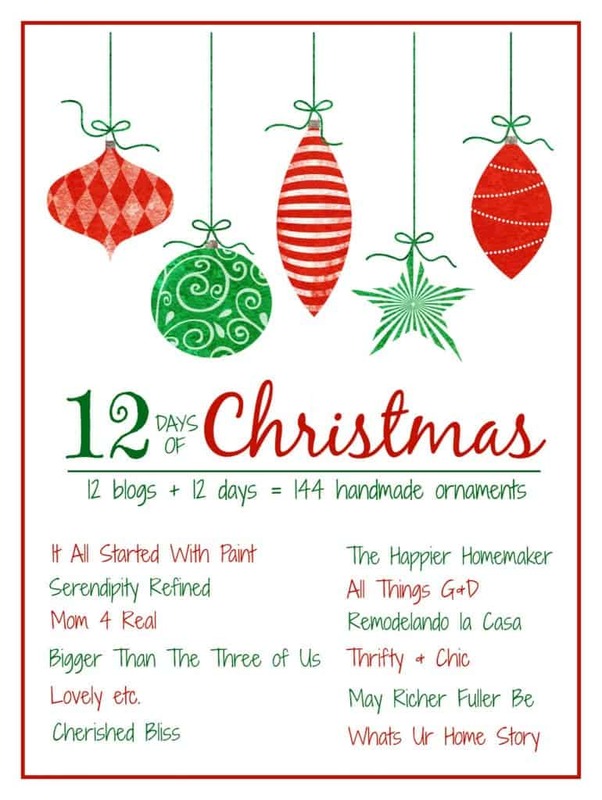 These look so cute and fun to make! Could I use regular apple juice instead of apple sauce? 🙂 I live in Norway, so don’t know what I would use if not, or where to find apple sauce. Also, 200 degrees fahrenheit or celsius? Assume it is fahrenheit, but I just want to be sure. Apple juice and apple sauce are not the same thing. Apple Sauce is the whole apple smashed and cooked down. Hi Karine, the temperature is in Fahrenheit. I wouldn’t use just apple juice…but you could easily make your own applesauce by stewing apples in a little water-lots of easy recipes online! Could this dough be made in advance and put in the fridge? I don’t see why not Melanie! This is what I refer to as a “Pinfail”. I think you should have mentioned that these are extremely fragile and difficult to transfer to the cookie sheet for baking. I made about 6 and then dumped the rest.